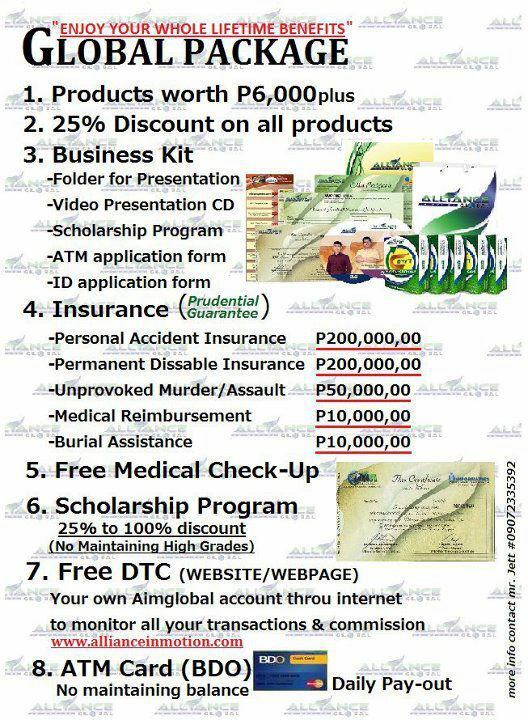 Enjoy the privilege of being an independent distributor and have your own GLOBAL BUSINESS with six (6) major ways to earn through the AIM Global International Expansion Program. Maximize your income potential by being part of today's fastest growing Point System Marketing Company. If you are into selling and because as a member you enjoy a lifetime 25% discount on your next reorder of products, you can sell these products at its Suggested Retail Price. The company allows up to 7 accounts (or heads) under 1 name. Multiple accounts have a much higher rate of return and a more efficient system compared to a single account. For the same amount of effort, you can maximize your income potential. In this plan you will get another commission in your down line reorder which varies on your position. Distributor – once you join in AIM Global, you are automatically become its distributor. In this position you have 0% commission from your first level to infinity level. Silver Executive – in this position,you need to accumulate 10 Positional points. This is not individual points, it is a group points. If you get promoted as SE, you will have additional 10% commission on group product sales from first level to infinity level. Gold Executive – in this position, you need to accumulate 100 Positional points. It is also a group points. If you get promoted as GE, you will have additional 20% commission on group product sales from first level to infinity level. Global Ambassador – in this position, you need to accumulate 1000 Positional points. It is also a group points. If you get promoted as GA, you will have additional 30% commission on group product sales from first level to infinity. This is for those who are already Global Ambassadors. You will earn 2% of Group Reorder Points from your down lines who are also Global Ambassadors up to the 5th level Global Ambassador. If you are promoted as GA with 2000 points, your 1st level is also a GA with 2000 points, 2nd level with 3 level 1 GA, and in 3rd level with 5 level 1 GA, you will have 2% profit sharing commission based on company's sales in a year. Given to qualified Global Ambassadors, they receive a percentage of the company’s profits.